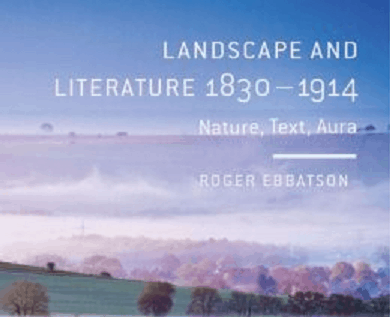 In this guest post, Professor Roger Ebbatson talks about his new study of landscape in literature of the period 1830-1914, and sketches out some of the key links between people and their environment in this pivotal period in British history. In examining the ‘spaces’ of literary production in the nineteenth century my new book, Landscape and Literature, 1830-1914: Nature, Text, Aura, sets out to situate the sense of self through a phenomenological sense of being-in-the-world, whilst also paying attention to a progressively more intense sense of loss or destitution associated with the technologically fuelled dogma of progress. The ‘light of the word’ which illuminates my illustrative texts from Tennyson, Hardy, Richard Jefferies (the first writer to use the term ‘wild life’, in 1879), and others is thus refracted through a sense of the declination of the Benjaminian ‘aura’ in the artwork and its representation of nature. The humanity established in romanticism through an ineluctable link with the natural world becomes significantly destabilised in the period of modernity, and I seek to illustrate this in relation to the textual topography of various literary examples. The book draws upon eco-critical issues pertaining to the representation of landscape, and examines the link between these landscapes and the groups who identified themselves in terms of their environment (such as witnesses of working-class suffering at Flintcomb-Ash in Hardy’s classic novel Tess of the d’Urbervilles). Instead of adapting a conventional academic structure, I offer the reader a series of short but interlinked pieces which may be read as ‘constellations’, or as a mosaic pattern intended to resist the false trajectory of literary evolution. The fragmentariness or disjunction of the book, therefore, is a deliberate ploy which resists academic petrification by invoking the Benjaminian notion of the dialectical image – which flashes up with intermittent immediacy to refract notions of release and oppression. If the literary representation of landscape is posited in notions of ‘dwelling’ and ‘being-in-the-world’, the aesthetic potential of this Heideggerian ‘open realm’, I argue, is increasingly subject to deformation, mobility and exile in a cultural process which, for my purposes, culminates in the blasted terrain of the Great War of 1914-18. My book thus offers a series of case-studies which seek to illustrate or mobilise issues surrounding the growth of the culture industry and the administrative society and the countervailing impulse towards a poetry of sensation evocative of the free life of nature. The first section offers readings of a variety of Tennysonian texts, including ‘Locksley Hall’ and the dialect poems, alongside consideration of the writings of Arthur Hallam and the sonnets of Charles Tennyson Turner. The second part of the book is devoted to a number of texts by Hardy, Jefferies and Ruskin, and culminates in a survey of the literary space of the South Country and its tragic apotheosis at the Western Front. Roger Ebbatson is a Visiting Professor of English at Lancaster University. He is the author of numerous books including The Evolutionary Self: Hardy, Forster, Lawrence (Harvester Wheatsheaf), Hardy: Margin of the Unexpressed (Sheffield Academic Press), and An Imaginary England: Nation, Landscape and Literature, 1840-1920 (Ashgate). His most recent book, Landscape and Literature, 1830-1914: Nature, Text, Aura (Palgrave Macmillan), was published in 2013.